The premium features and advanced design of the XTERRA Fitness TRX4500 Folding Treadmill allow users of all fitness levels to challenge themselves and maximize their results. The 7.5" bright blue backlit LCD display with 30 pre-set programs provides the variety needed to take your fitness to a new level. The heart pounding speed range up to 12 mph is powered by a smooth and quiet XTERRA 3.25 HP motor. The included chest strap heart rate transmitter and handlebar mounted hand pulse grips give you two ways to monitor your heart rate making your workouts both efficient and effective. With the XTERRA status comes our seal of approval with an impressive lifetime frame and motor warranty, 5 years deck, 2 years parts, and a full 1 year of in-home labor. Handlebar mounted speed and incline controls are conveniently located on the handlebars - they are right where you need them for a comfortable and secure workout. Heart Rate pulse grip sensors are also conveniently mounted on the side handlebars to help keep your workouts safe and effective. On top of that, it also includes a wireless heart rate chest strap transmitter that works in-sync with the treadmill itself. XTRASoft deck cushioning technology provides multiple points of cushioning throughout the deck support system in order to provide maximum impact absorption exactly where you need it. 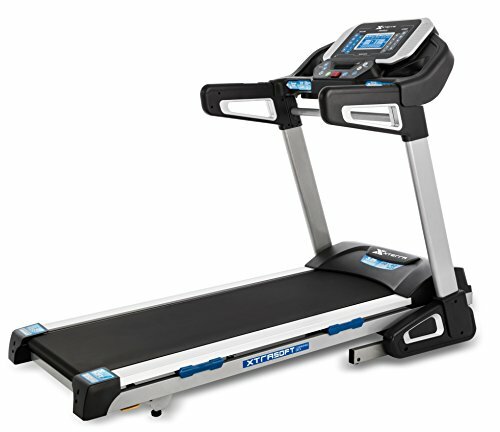 Deck also folds with Lift Assist which helps when lifting to fold up the treadmill deck while the Safe Drop feature slowly lowers the treadmill deck for added safety. Integrated carriage design with transport wheels allow for convenient storage and mobility once folded. Free Economy: Delivery includes appt with a 4hr window. Delivered curbside with lift-gate. Delivery will not bring product into your home. // Standard Shipping: Delivery includes appt with a 4hr window. Delivered by one driver with lift gate, and equipment to get it inside the first enclosure (e.g. garage or front door). No stairs or steps. // Both options typically deliver in 1-2 weeks. Actual delivery date will vary based on your scheduled appt. Delivery appt window does not include weekends. Walkslide Manual Treadmill,Elliptical & Nordic Skier in one! Compact, Portable, Quiet, Low impact, Lose Weight!